G. E. Bentley wrote this review in 1991, but it went astray. 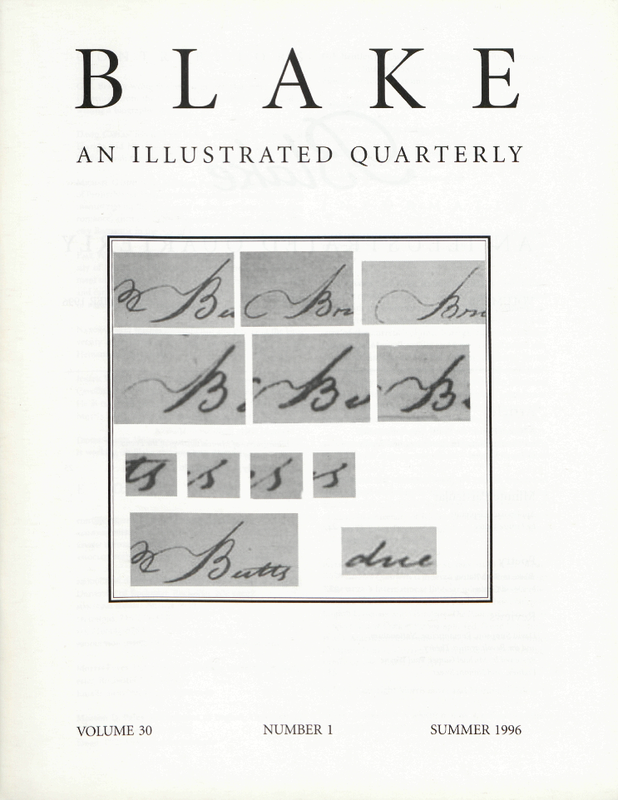 He retired from the University of Toronto in 1996 and is writing a biography of Blake. David Caplan received an M.F.A. from the University of Florida and is currently working toward a doctorate in English from the University of Virginia. Paul Wayne Rodney is completing his Ph.D. at the University of Michigan. His dissertation examines the development of domestic tourism in Britain in the late eighteenth and early nineteenth centuries as it relates to the definition of national and individual identity. Nanora Sweet teaches romanticism and poetry at the University of Missouri at St. Louis. She publishes on Felicia Hemans and her circle. Joseph Viscomi teaches English at the University of North Carolina and is the author of Blake and the Idea of the Book. He is currently coeditor, along with Robert N. Essick and Morris Eaves, of the electronic Blake archive. Denise Vultee, University of North Carolina at Chapel Hill, is working on Blake and romantic Hellenism. Cover Illustration: A selection of Bs, s, and us from the 1805 receipt, see page 9.